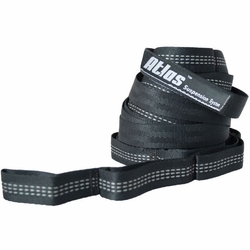 ENO Atlas XL Hammock Strap Suspension System. You've got the perfect hammock, the perfect trees, but your suspension system won't quite reach? Welcome, Atlas XL. The Atlas XL shares the agile and enduring characteristics of its younger brother, the Atlas, but boasts an extra 54" in length and 10 extra loops. Constructed from Poly-Filament webbing with overlapping attachment whorls and weighing just 16oz, the XL will support your hammock in even the most extreme spaces. Eagles Nest Outfitters. Dimension: (LxW) 13.5' x 1"